(Newsweek reported) "The Germans wrote off Southern France as a total loss last week. The badly mauled Nazis fled from the territory from the Lyon region to the Atlantic, including the port of Bordeaux. The mass exodus came after Field Marshal Johannes Blaskowitzs Nineteenth Army had disintegrated under the blows of Lt. Gen. Alexander M. Patchs Seventh Army of Americans and French. The battered horse-drawn artillery of two German divisions cluttered both sides of highway seven. The main body of the Nazis retreated up the narrow Rhone Valley, where they were made the target for one of the most intensive air attacks ever directed against ground troops. 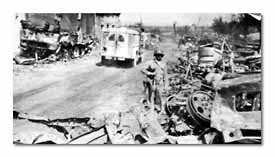 Smashed vehicles, dead horses and Nazi casualties clustered thickly by the sides of the roads. But repeated American efforts to trap the fleeing Germans did not wholly succeed. A substantial portion of five retreating divisions broke out of the trap and pushed up the valley." (Zeke Cook gave this account of the battle): "The heaviest fighting of the South France campaign has been in what I call the Drome Bowl. This area is bounded on the north by the Drome River, west by the Rhone River, south by Montelimar and east by a series of hills stretching north from Marsanne. Route Seven, the main road north, bottlenecks just north of Montelimar where high ground forces it to the river, goes through the valley floor from La Coucourde to Loriol, then bottlenecks again at the Drome because Allied air forces knocked out the bridges. This 10-mile stretch is the field for the Drome Bowl battle. This week I prowled the field after the contest was over. To my belief, the final score was no more than a tie. In the kick-off play, an infantry company had failed to establish a roadblock despite a quantity of artillery support. From an artillery observation post on a high hill overlooking La Coucourde I watched a second attempt. The press party, shepherded by Capt. Joseph Dine, Worcester, Massachusetts, trekked to the top of the hill through waist-high scrub oaks. We crawled over the lip on our bellies, first concealing anything which might glint in the sunlight. 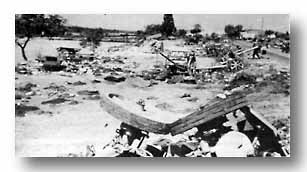 Division ambulance passes another portion of German wreckage. Enemy ran 16-mile gauntlet of fire. The grandstand seat we reached was a high nose of ground from which a company had been driven the day before. Below, the gently sloping valley was checkerboarded with neat French farm fields. To the right, where the highway disappeared into the mists toward Valence, one bridge still stood. At H minus 10, the artillery opened up with a terrific barrage. In the eerie silence which followed, there was a brief moment of still life in the valley. Then a carefully spaced convoy, including a dozen vans marked with the Red Cross, suddenly streamed northward. 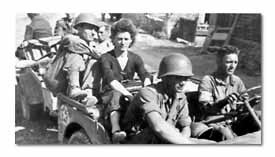 143rd Infantrymen brought in this woman who had been fighting with the Germans in battle for Loriol. Watching, we waited for the sound of small-arms fire which would indicate that the infantry was moving down to make the roadblock. It never came. Crawling back to the command post, we learned that the GIs had occupied the road without a fight. But later that night they were assaulted by German tanks and infantry coming up from the south and the block was broken again. Stephen R. Gregg, Bayonne, N. J., . . . 143rd L. Co. warrior-buddy of "Commando" Kelly, was awarded the CMH for outstanding bravery at Montelimar. Firing a machine-gun from his hip in defiance of a large body of Germans, Gregg acted as sole interference for a medic who evacuated seven wounded men to safety. At the point of being captured, the technical sergeant, later battle-commissioned, grabbed an enemy machine pistol and escaped to a position from which he managed to either kill, wound or capture every member of the German crew. On the following day, single-handedly charging the Germans with a hand grenade, he drove them out of a mortar position which they had seized in his absence.